The holiday season is a time when you want to put your best face forward, and that means flashing your friends, family, and colleagues a natural-looking, clean, bright smile. To optimize your smile and make sure that you are not accidentally harming the enamel of your teeth or your gum tissue, it is best to enlist the help of Dr. Gary Skrobanek at GPS Dental and invest in professional teeth whitening options. When you bleach your teeth with custom whitening trays, it is only required occasionally, unless you are a full-time smoker, red wine drinker or eat raw turmeric on a regular basis. One of the major drawbacks of using the whitening trays or strips that you buy at the drugstore is you may feel the need to bleach your teeth more often, which, in turn, can result in damaged gums and weakened tooth structure. When you have it done professionally, the results also last longer and aesthetically look better. 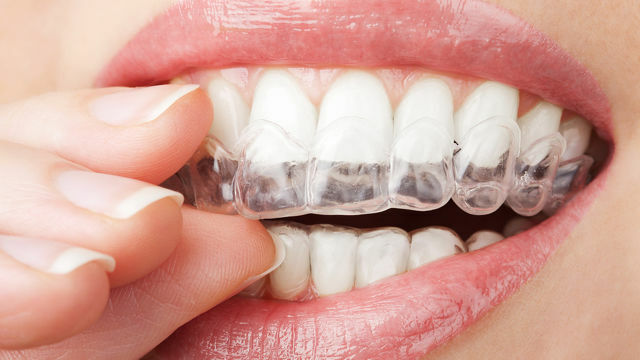 Custom whitening trays are meant to fit your teeth like a glove so that every curve, fissure, and tiny nook is coated evenly with professional teeth whitening gel. First, Dr. Skrobanek makes molds of both your upper and lower teeth with impression trays. These are thick pink slabs of moist impression material. You bite down on the impression material until it hardens and then he removes it and sends it off to the laboratory. The laboratory creates thin plastic transparent molds of your teeth. Dr. Skrobanek and his team will then show you how to apply desensitizing gel to your gums to prevent any pain. A dentist-strength 22% Carbamide Peroxide is then applied to the tray through a wide-mouthed syringe, and the molds are then fitted over and pressed against the teeth for a prescribed amount of time. Many people see whiter teeth with just one treatment. Dr. Skrobanek will then send you home with the trays and whitening solution to use on your own every night for a prescribed amount of days. The more stained or yellow your teeth are, the longer it will take, but the spectacular result is often well worth it. You might achieve some success by using a tooth whitening kit from the drugstore, but these do-it-yourself dental bleaching kits are not as effective as a professional whitening treatment administered by a dentist. This is because these trays often require you to mix a peroxide solution, which could be concocted incorrectly or left on too long, which, in turn, achieves patchy-looking results. Another issue is that over-the-counter trays are a one-size-fits-all solution, as opposed to the custom fit provided by Dr. Skrobanek. The custom whitening trays, hug the surfaces of your teeth, ensuring an even white shade across the surface of your smile. Furthermore, he will prescribe a solution that bleaches your teeth to a level of whiteness that looks natural. Teeth that are too white or can look so fake that others think you are wearing dentures. Yet another risk of using over-the-counter whitening trays is that you can accidentally burn your gum tissue and cause pain and permanent tissue loss. Using the incorrect ratio of peroxide in a mixed solution can also damage your teeth, resulting in a scratched, chalky appearance. The best tooth whitening process leaves your teeth looking as white as they were when you were ten years old. If you would like a whiter, brighter smile to help you usher in the New Year, then be sure to schedule your appointment today for teeth whitening at GPS Dental by calling (210) 633-3477. Dr. Gary P. Skrobanek and his experienced, friendly team at GPS Dental offer affordable family dentistry and gentle dental care in the San Antonio, TX area. Our Brooks City Base dentist office is conveniently located and offers early morning appointment times Monday through Friday to meet your needs. At GPS Dental, we provide most dental services, from family and general dentistry to dental implants, sleep apnea, TMJ / TMD Treatment, cosmetic dentistry and much more. We accept most dental insurance plans and offer affordable financial solutions for any budget. Call us at (210) 633-3477 to make an appointment.